If you own a Syrian hamster, you may have heard of Wet Tail Disease. Worried that your hamster may have it now? Or wondering how to prevent Wet Tail Disease in the future? We’re researched this in detail to bring you a concise and detailed guide. This post was written with help from Dr. Alicia McLaughlin, DVM. Dr. McLaughlin received her DVM degree from Oklahoma State University and is now an associate veterinarian at The Center for Bird and Exotic Animal Medicine in Bothell, WA. Dr. McLaughlin is a member of the American Veterinary Medical Association as well as the Association of Exotic Mammal Veterinarians, among other professional organizations. Wet Tail is, in fact, a syndrome and not a single disease. The term “Wet Tail” describes any medical condition which results in a hamster developing diarrhea and diarrhea-related symptoms. While especially common in young hamsters and Syrian hamsters, it can affect hamsters of all ages and breeds. This guide will inform you of not only what Wet Tail Syndrome is, but also how you can treat it when it does wreak havoc on your pet’s health. You will also learn how to prevent this common but devastating ailment from happening in the first place. Hamsters are vulnerable to a wide array of different conditions, which is really no different from any other animal that you may take into your home as a pet or companion. Of these ailments, Wet Tail Syndrome is widely considered one of the most potentially fatal. It is in the best interest of any hamster owner to learn what symptoms to look for, how to address a course of treatment, and what they can do to prevent future occurrences of the disease. What are the Symptoms of Wet Tail Syndrome? Let’s look into these in more detail. Lack of energy, loss of appetite, lack of desire to groom itself, dehydration, sunken eyes, aggression or irritability, a hunched back when the hamster walks, blood in their feces and abdominal pain. The wet tail is often what clues hamster owners into their pet’s condition, as many of these other symptoms can result from any number of other, unrelated illnesses. Which Hamsters are Most Vulnerable to Wet Tail Syndrome? Matured dwarf hamsters seem to be the least commonly afflicted group of hamsters, but keep in mind that no hamster – regardless of age or breed – is immune to the detrimental effects of Wet Tail Syndrome. As this is a stress-related syndrome and no hamster is unaffected by stress, any hamster can come down with wet tail. Long-haired Syrian hamsters – also known as Teddy Bear hamsters – are the most commonly diagnosed with this condition, especially those between three and six weeks of age. Is Wet Tail Syndrome Fatal? In many hamsters, Wet Tail Disease is a death sentence. 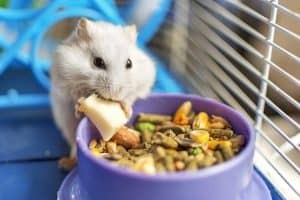 Fortunately, if the first symptoms are noticed and addressed by a veterinarian in 24 hours or less, there is a chance that your hamster could survive. Wet tail is a very serious issue that has taken the lives of many hamsters, even those owned by people who practiced the highest quality of hamster care in their homes. Your hamster is especially high-risk if they are very young, very old, or are sick with another condition while suffering from Wet Tail Syndrome. The outlook in many cases is often a bleak one. What Causes Wet Tail Syndrome? There are many potential causes for Wet Tail Syndrome, including bacterial infections, parasite infections, inappropriate diet, and stress. Living in a dirty or overcrowded enclosure for too long can lead to wet tail disease. It is worth noting that dirty cages are not the primary cause of Wet Tail Syndrome, so if you are making sure that your hamster has a clean home at all times and they contract it anyway, know that their cage likely had nothing to do with it. Not sure? Read our guide about how often you should be cleaning your hamsters’ cage. The biggest contributing factor in the development of Wet Tail Syndrome is stress. Wet tail effects young hamsters more than any other group because of the stress that is associated with removing the baby hamsters from their mothers prematurely, especially if they are sent off to a new home altogether immediately following the separation. Noisy living conditions, being handled too much or too soon and stressful encounters with other animals can create an atmosphere in the hamster’s body that increases the chances of the animal for developing diarrhea. How is Wet Tail Syndrome in Hamsters Treated? The only way to get a positive prognosis for your hamster is to get them in to see a vet as soon as you notice symptoms of Wet Tail Syndrome. Treatment must be prompt, to help ensure that your hamster will live to the fullest extent of their two to four-year lifespan. Supportive care, including antibiotics, fluid therapy, pain medications, and other treatments will be prescribed by the veterinarian and you will be given explicit instructions to follow, including the close monitoring of your sick pet. Your veterinarian will recommend performing diagnostic tests to try to find out why your hamster developed Wet Tail, as the underlying cause must be treated in order for your pet to recover. If your hamster does not get into the vet’s office in time, Wet Tail Syndrome will quickly kill them. However, there are some at-home things that you can do while waiting for your vet appointment and after they have been seen by their veterinarian to bring your hamster as much comfort as possible during this time. The first thing that you should do when you notice any signs suggesting Wet Tail Disease is to quarantine your hamster from other animals, especially other hamsters. Place them in a separate enclosure from their usual home where they can be safe. This area should be warm, secure and out of the way of direct sunlight. Now you can set to cleaning everything that your hamster normally comes into contact with. Clean the cage with soap and water but avoid using antibacterial soaps as the chemicals can irritate the skin of hamsters. If you do use an antibacterial cleaner, make sure that you are using a pet-approved one from the pet store that is marked as safe for use in hamster cages. Toss out their existing bedding and get it into the trash immediately. Clean their toys, water bottle, food dishes, wheels, hamster balls and other items that they use with the same mild soap and water that you used to clean their cage. Some items can be submerged in boiling water if you are worried about lingering bacteria. Always make sure to wash your hands after handling your diseased hamster or any of their possessions! Do not attempt to bathe your hamster. This is stressful to hamsters even under the best of circumstances and can make your pet’s condition worse. Make sure that their enclosure, toys, water bottles, and food dishes are clean and 100% dry before reintroducing them to their cage. Never miss a dose of their prescribed medications. These medications are doing important work by killing the bacteria responsible for your hamster’s illness and supportive the rest of your hamster’s bodily functions, and can only do their job when taken exactly as directed. Wash your hands after every instance of handling your hamster. Make use of a water dropper to ensure that your hamster is getting adequate hydration, especially if they do not seem responsive to their water bottle or you cannot be sure that they are drinking enough. Monitor their food and water intake closely. Your vet may recommend the use of probiotics to help your hamster’s body to purge itself of the remaining infection. Probiotics are great for overall gut health but should not be given to your hamster without the advice of your vet. If you take all of these steps and have sought medical attention for your afflicted hamster in a timely fashion, you may have a great outlook to look forward to. Sick hamsters need to be handled with care, especially where the potentially-fatal Wet Tail Syndrome is concerned. Side note: If you have other hamsters that were around the infected hamster before you realized their medical condition, your vet may also prescribe antibiotics to prevent the potential occurrence of additional Wet Tail Syndrome infections. How Can Hamster Owners Prevent Wet Tail Syndrome? Like with most other illnesses, you can stave off Wet Tail Disease by taking preventative measures to promote the ongoing good health of your hamster. Unfortunately, even the most well cared for hamsters can become sick with Wet Tail Syndrome, but through proper hamster care, you can minimize their risk of becoming sick or dying from it. 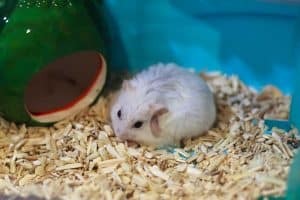 These tips are simply good practice for any hamster owner and should be followed regardless of your pet’s age, breed and the condition of their health. Change their bedding and wash their cage once a week with a mild (not antibacterial) soap. At the same time, wash all of their toys, their food dishes, their water bottle, wheels and anything else that they come into contact with in their cage. To limit stress on your hamster as you introduce them to their new environment, keep handling to a minimum and keep them on the same food that they were eating at the store or breeder’s place. Ask about Wet Tail Syndrome with the store or breeder that you get any new hamster from. If they don’t know what you’re talking about, do not get a hamster from them. If they don’t know the signs of wet tail, they might not know if they’re selling you a sick hamster. When buying a new hamster, make sure that a vet gives them a clean bill of health before introducing them to other animals or people in your home – especially other hamsters. 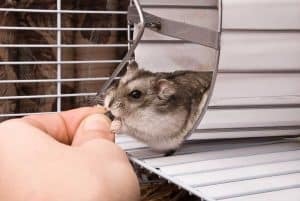 Hamsters are relatively low-maintenance pets to have in the home, but that doesn’t mean that routine hamster and cage care can ever be neglected. If your hamster becomes seriously stressed due to a messy cage, loud noises or frequent handling, they can become very sick, and very quickly at that. A diagnosis of Wet Tail Syndrome is a scary one, as any knowledgeable hamster owner can tell you. The symptoms and poor prognosis that come with this condition can be difficult to manage once the hamster has already become infected. As it goes with any other ailment, it’s best to prevent infection rather than treat it once it makes an appearance. However, even healthy hamsters in great homes can be made sick by this infection. Wet Tail Syndrome is not necessarily reflective of the owner. Tragically, any hamster can get Wet Tail Syndrome regardless of their owner’s diligent care. When this happens, do not try to care for the condition at home yourself. Get your hamster into a veterinarian’s office as soon as you possibly can to garner the most optimistic outlook possible. Finally, we’d like to once more thank Dr. Alicia McLaughlin, DVM, again for helping us make sure hamster owners get the right information they need about Wet Tail Syndrome Disease.